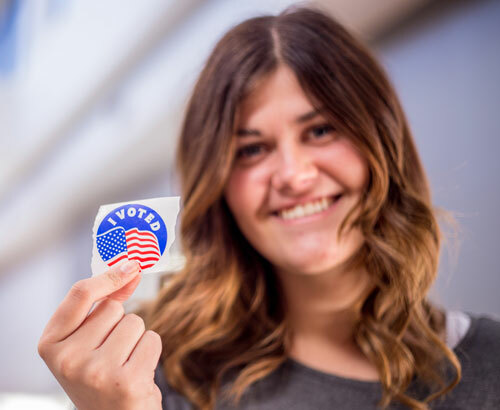 Through work done by the Michael O. Leavitt Center for Politics and Public Service, Southern Utah University was recognized for its student voting rates during the 2016 election. The recognition came from the first-ever ALL IN Challenge Awards Ceremony, held to honor colleges and universities committed to increasing college student voting rates. SUU earned a bronze seal for achieving a student rate between 50% and 59%. The Leavitt Center worked with the ALL IN organization to register voters on campus, promote civic engagement among students, and analyze voting rates. Student participation in elections has increased in the past few years. A recent report from the National Study of Learning, Voting, and Engagement (NSLVE) shows that between the 2012 and 2016 presidential elections, student voting went from 45.1% of eligible voters to 48.3%- a 7% improvement. SUU had a 49.7% voting rate for the 2016 election, a 1.1% change from 2012. The predominant method of voting was by mail followed by in-person. Voting rates increased by age group, with 83.7% of 50 and older students voting in the election. The ALL IN Campus Democracy Challenge is a national awards program. The Challenge encourages higher education institutions to help students form the habits of active and informed citizenship, and make democratic participation a core value on their campus. By joining the Challenge, campuses commit to convening a campus-wide committee, developing and implementing an action plan to improve democratic engagement, and participate in the NSLVE. More than 300 campuses, enrolling more than 4 million students, have joined the Challenge since its launch in summer 2016. A full list of seal awardees can be viewed here.